» Left-lane bill: Who needs it? Left-lane bill: Who needs it? Driver’s view of I-5 traffic northbound somewhere near Cottage Grove. 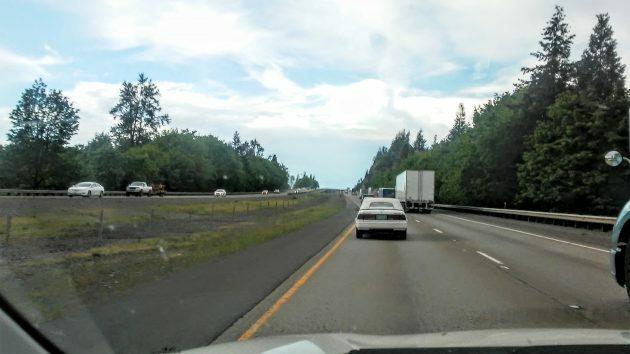 Returning to Albany Thursday afternoon from Southern Oregon, I could see no need for Senate Bill 532, the “don’t-hog-the-left-lane bill.” All of us on the freeway did just fine without it. Maybe that’s why the bill, after clearing the Oregon Senate, was still stuck this week in a committee of the House. A “condition”? “Necessary”? Who decides? Laws are supposed to tell people just what is not allowed. This bill fails the test. As a practical matter, if drivers hang in the left lane longer than others behind them think proper, there’s usually a reason, the main one being that there’s a big truck in the right lane, or a bunch of trucks. If the right lane is open, drivers who don’t want to wait can pass the slower vehicle on the right. Or they can wait a bit. So what exactly is the problem that the bill is trying to fix? The House Committee on Transportation Policy held a hearing on the bill on April 26. One of the witnesses said that in Washington state, which has a law similar to the Oregon bill, the highway patrol pulled over left-lane drivers for “impeding traffic” 13,000 times in a year. Is that what we want, thousands of bogus reasons to write citations? Occasionally a left lane driver holds up cars with nothing in the right lane. I will pass on the right, and drive in the right lane for miles before needing the left lane. Sometimes others will also pass on the right and the left lane driver simple does not get the hint. I agree, Hasso, that such a law would be subjective and difficult to inforce, however the driver described here needs a ticket. Coming home tomorrow from 16 days in Europe, with a lot of autobahn driving at 100mph plus. I have found German drivers to understand the concept of driving in the appropriate lane. I recall that years ago Oregon drivers also drove properly on the freeway. Can you imagine. It would look like the Daytona 500 with all the lane changes. I wish the legislature would look to do something valuable like fix PERS, fix a highway, repair bridges etc. They’re forever looking to invent Mickey Mouse ways to protect us from ourselves. Go work on a worthwhile project or just call the session now! But it’s the JOB of the legislature to make laws… and if there’s no good reason for a law, they will make up laws for NO good reason. Laws are not needed if everyone practices Lane Courtesy every time they drive. Sounds like they do where you are driving in the middle of Oregon. I’ve been a fanboy of yours for several years, regularly and repeatedly awed by your ability. But…and there’s always a but – It occurs your readers become highly agitated by many of the topics you examine. Agitation elevates blood pressure. Then its down the old slippery slope from there. Even your screed on an “old classic car” drew the ire of several CARA-Haters, their systolic and diastolic readings fluctuating wildly. The point is, you may be personally responsible for foreshortening four or more lives simply by performing the act you perform. To that end, I, along with several hundred others, urge you to employ sensible sensitivity in story choice. Ha Ha. That is humorous! Reminds me. I’m eagerly awaiting the next HH post on sea levels or global climate change. You see I read an article yesterday that is quite disturbing. Can’t wait to share the link along with commentary. Here’s to hoping HH has a coast trip planned soon. In my opinion, a huge part of Oregon’s traffic issues are the fact that truck speed limit is 55 where cars are 65…… make it the same so the flow goes with the flow…. And at one time there was a law that if there were 5 or more cars behind you, you needed to pull over and let them by. I guess that law didn’t work so I acquiesce; this measure, should it become law, probably wouldn’t work either. I have come to hate freeway driving. The left lane law may seem subjective, but those utilizing the left lane as their own, with no cars clearly in the right lane for a considerable distance, will come to an end. All these unnecessary, risky lane changes by others to overcome a pace car in the left lane, which drops the average speed of traffic, will become unneeded. Many people have driven for many many miles down a freeway in vehicle cell clusters waiting as they are impeded by left lane dwellers. This is dangerous when the cars begin to take risks to get by these dwellers. Unnecessary risks. The trip to southern Oregon where there is less traffic, does not depict how traffic is between larger urban areas. You clog a freeway, you jam everything else attempting to get to it. The reason of the need of this law……Because some need consequence as direction, as they simply are not capable of understanding their own driver behavior and the effects. The freeway is for moving large numbers of vehicles quicker and without stops or bottlenecks of the typical side streets and rural roads/highways, and this isn’t possible with some driving as they please as opposed to what is more efficient, safe, and reasonable for the majority. ODOT can go ahead and put up more, “Slower Traffic Keep Right Signs” and OSP can make sure people are doing it. Don’t like to travel at the pace traffic is moving?…..you do not belong in the left lane. Sometimes when a major artery is clogged, you have to take your medicine to make it right….this law is the medicine.